Everyman’s Dictionary of Economics, the third volume of The Collected Works of Arthur Seldon, translates the often obscure jargon and technical terminology of economics into direct, plain English understandable by both the academic and the layperson. The most abstruse topic becomes clear as he conveys the sense in ordinary language, without loss of meaning through oversimplification. Everyman’s Dictionary of Economics covers a wide range of economic thought and includes every relevant term that the average person might encounter in a written or other treatment of the subject. In addition to conveying a sense of how economic thought has evolved over the centuries, the Dictionary stimulates and challenges readers in its questioning of conventional wisdom about government intervention and manipulation of economies. It too has “stood the test of time”; nearly thirty years after the second edition and forty years after the first, this book still engages readers—economists and nonprofessionals alike. 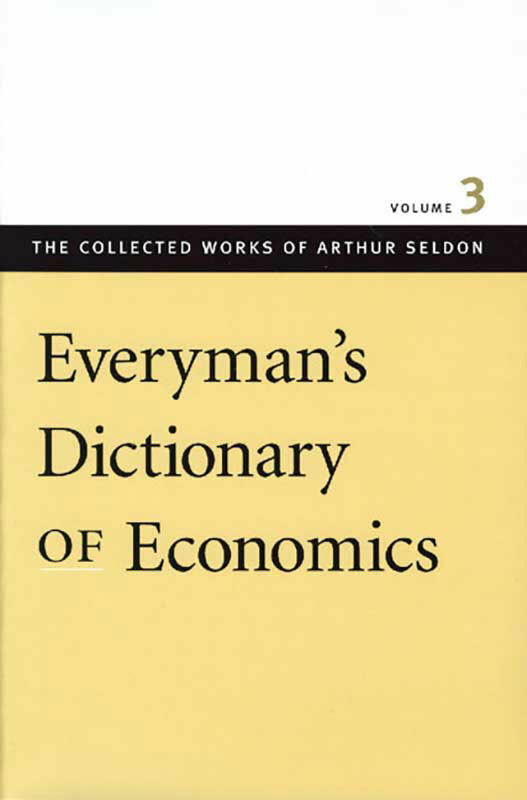 Everyman’s Dictionary of Economics, Volume 3 of The Collected Works of Arthur Seldon, is an indispensable reference for laypeople and for academics. Introduction to the Liberty Fund edition, introduction to the second edition, introduction to the first edition, related subjects index, reading lists.